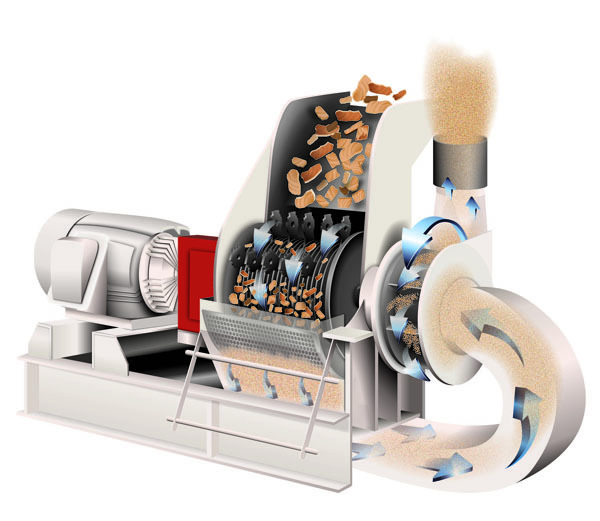 Processes scrap wood to a profitable grind in minutes. Takes shavings and chips directly, and finishes the job a hog begins on slabs and edgings. 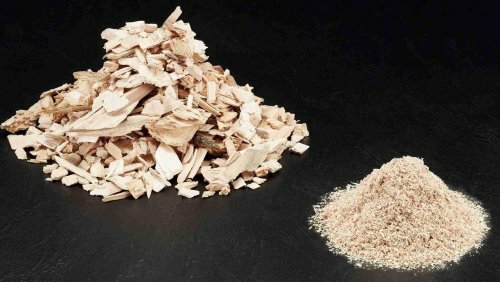 It produces a uniform, first quality sawdust that you can market for compost and litter, for polishing and use in tanning operations, for the manufacture of press board, roofing paper; animal bedding and more. Greater production at lower costs per ton assures maximum profitability from your wood scrap processing. Much heavier, longer-lasting machine for considerably less money. Initial investment is usually recovered in a remarkably short time and maintenance costs are minimal. It offers innovative features and uncompromising quality in construction and workmanship. Features special ribbed grinding plates located at the front and rear of the machine to handle bark and other troublesome material with ease. Action against the plates cuts and disintegrates the wood fibers promoting faster and more effective screen grinding. Properly sized vacuum fan system minimizes power consumption. We match CFM to the mill's screen area for optimum throughput capacity. Fan systems are available from 4,000 CFM up to 15,000 CFM. Separate motor driven fan systems provide for positive evacuation. Extra rugged, all-welded-not riveted - steel construction increases wear life and make it impossible for blades to fly off for added safety. The housing is equipped with a replaceable liner and is designed to allow removal of both fan and liner without disturbing the blow pipe. Screens slide in and out freely and quickly. The bar handle used for removing and inserting the screens has an exclusive, patented eccentric lock. As the handle is pushed down, the screen is positioned for perfect hammer tip to screen clearance and locks automatically into place. Heavy notched hammers are provided for normal wood residue grinding. Fine, close grain, specially hardened steel retains sharpness and has the toughness needed to withstand wear Heavy, hardfaced strap hammers are recommended for such materials as bark. They are made from special steel and heat treated to retain sharpness in long, full service life.